Knotty Ash is an area of Liverpool, Merseyside, England, and a Liverpool City Council Ward. Historically within the county of Lancashire, the population at the 2001 Census was 13,200, increasing to 13,312 at the 2011 Census. Knotty Ash is a small area on the eastern fringe of Liverpool and neighbours the West Derby, Old Swan, Broadgreen, Dovecot and Huyton districts. Its name is derived from a gnarled ash tree which formerly stood near the present-day Knotty Ash public house. In 2004, comedian and local resident Ken Dodd planted a new ash tree close to the site of the original. Knotty Ash is represented on Liverpool City Council by three councillors and is wholly within the Liverpool West Derby constituency. The current MP is Stephen Twigg, Labour who in 2010 replaced the former Labour MP Bob Wareing who had resigned the party whip in 2007. Knotty Ash contains the special needs secondary school Clifford Holroyde and a primary school, Knotty Ash CP. The area is served by the number 10 bus service on the Liverpool-Prescot route and the suburban number 61 route between Bootle and Aigburth. It lies just north of the western terminus of the M62 motorway. Knotty Ash railway station on the North Liverpool Extension Line formerly served the area, but this closed to passenger traffic in 1960. The former trackway is now part of National Cycle Network Route 62. Between 1951 and 1968, the district was home to the city's rugby league team Liverpool City who played at their Knotty Ash Stadium, Mill Yard. Their playing strip consisted of white jerseys with a broad green hoop and white shorts. After the 1967–68 season, they left the district and moved to nearby Huyton, changing the club's name to Huyton RLFC. Having no home venue for the 1968–69 season, their new Huyton home ground of Alt Park was opened for the following 1969–70 season. In the 1960s, Knotty Ash was made famous in the United Kingdom by stand-up comedian and lifelong resident Sir Ken Dodd, as the home of the dwarfish comic characters he called the Diddy Men. In his BBC children's television programme Ken Dodd And The Diddymen (1969), the fictitious Diddyland, boasting the highest sunshine rate in the world, was situated in the centre of Knotty Ash. The Diddy Men worked in the local "Jam Butty Mines". 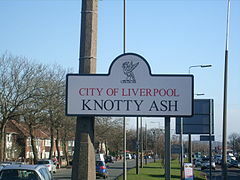 Knotty Ash is mentioned in the lyrics of the song "Liverpool Lullaby" written by Stan Kelly-Bootle. Knotty Ash was reportedly the site of the unsolved "Tiki" Murder in 1961 in which a housewife was killed in what was claimed to be a ritual linked to the worship of the Polynesian idol Tiki. ^ "City of Liverpool ward population 2011". Retrieved 13 January 2016. Wikimedia Commons has media related to Knotty Ash. This page was last edited on 26 July 2018, at 18:33 (UTC).